His Eminence Archbishop Georges (Tarassoff) of Syracuse (1893-1981) was an auxiliary bishop of the Ecumenical Patriarchate serving in its Russian Orthodox Exarchate in Western Europe. Abp. Georges born in Voronezh in Russia and settled in Belgium in 1919, where he worked from 1921 to 1934 in the capacity of a chemical engineer, in various enterprises. 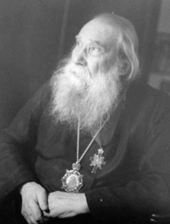 In 1928, he was ordained to the diaconate by Metropolitan Evlogy (Georgievsky) of Paris. He wanted to serve the Church as a deacon for the rest of his life, but on February 3, 1930, unforseen circumstances led Deacon Georges to receive the priesthood, through obedience to his bishop. He was named the rector of the parishes of the students in Gand and Louvain, parishes that had found themselves continually without a priest. In 1940, he was named rector of the St. Panteleimon parish in Brussels, which did not stop him from also serving other parishes in Belgium. Among his parishioners, he developed an exceptional zeal and became a living image of pastoral love. On October 4, 1953, Fr. Georges was consecrated to the episcopacy in Paris by Metr. Vladimir (Tikhonitsky), the successor of Metr. Evlogy, after which the Holy Synod of the Ecumenical Patriarchate of Constantinople elected him Bishop of Syracuse and auxiliary to Vladimir for Benelux and Federal Germany, with his residence in his former parish in Brussels. Abp. Georges celebrated the Divine Liturgy in numerous languages, including Dutch. After the death of Vladimir (in 1959), Abp. Georges became his successor and was elevated to the rank of titular archbishop. For more than 20 years, he found himself at the head of the Archdiocese of Russian Orthodox parishes in Western Europe, dependent on the Ecumenical Patriarchate of Constanantinople and having its see in Paris. This page was last edited on January 25, 2013, at 23:36. This page has been accessed 8,644 times.